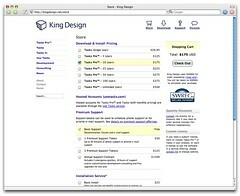 I finally launched the new King Design store and premium support options this past weekend. The new store page allows customers to choose any/all products they want to buy, including support and installation service, then check out in a single transaction. Checking out in a single transaction was possible before, but you had to know to click ‘back’ and add something else to the cart at the SWREG store. This new page allows you to choose everything at once, then enter the store – a much smoother shopping experience. I’ve also launched the premium support options I’ve discussed previously. These are available immediately, with premium support tokens available for sale on the store page. I’ve even got a page for retrieving support tokens if you misplace them. Of course, behind the scenes with all of this is a back-end system for token creation, processing, etc. – it’s worked well in my testing thus far. To offer phone support, I decided to sign up for a virtual PBX system. I choose to go with a OneBox Executive1 account because it is a lot cheaper than the multi-user offerings I saw at most places – features I don’t need. I’ll do a more thorough review of this once I’ve used it longer, but so far I like it. Now that I’m offering live support, I also need to be able to schedule this support. I’ve set up a free/busy calendar that customers can look at to choose an available time when requesting support. The data for this comes from a combination of several of my Google Calendars and is updated every 15 minutes – more on this in a follow-up post as well. If you see any problems with these new features or have constructive feedback, I’d love to hear it. Oh, I also added a testimonials page that has a bunch of customer quotes – stuff that folks have generously sent in for this purpose over the years. I had to migrate the data over from it’s previous home and look everything over to make sure it came over properly. It was nice to re-read some of the kind things these folks have said about m and my products. It was a pretty heavy working weekend for me, but I got a lot of stuff done. Still a few more things to finish up before the new Tasks Pro™ and Tasks™ releases, but I’m seeing the light at the end of the tunnel now. Yay!